So here is my first “from scratch” hat. I have made a few that have other hats as their interior, and I have trimmed out several more hats, but I had never to this point, made one myself. 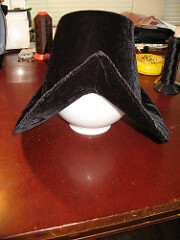 I do not recommend making you first hat out of Black velvet. It is quite difficult to see what you are doing without strong light! This is for Miss Sharon Thompson. She of the fabulous undies. I have not really worked on her stuff lately, but I will be seeing her shortly, and her new dresses will begin as well. I started here though because I could, and I was in the mood for some thing different. This is another of Miss Heather’s lovely patterns. I had no easy how simple, yet exhaustively tedious this process would be. A dear friend of mine Stephen Bishop has made piles of hats, and he gave me quite a few pointers, but even so, it took longer than I expected. Isn’t that just the truth with sewing in general! 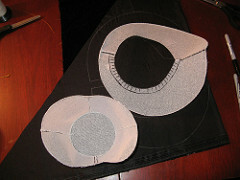 Laying out the pattern was extremely simple, as was the cutting. I bought the buckram from Vogue Fabrics in Chicago. I had the millinery wire laying around since a french hood project that never happened. Although I am much less afraid of that now! With supplies in hand I went to work! 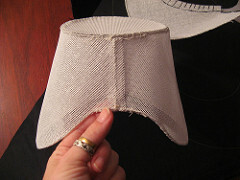 It had been suggested to sew the wire on before you cut out the pieces. I think this might have worked on a hat with less of an extreme brim. I could not get it to work at all that way. I also just could not get the wire to stay, and put it down with machine, so here is where the tedium started. I put the entire thing together by hand. 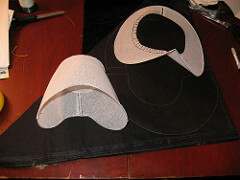 The only machining I could do was a little seaming, and stabilizing around the interior brim. One of the really great things about velvet is that the nap hides your stitches. Using the machine to stabilize the interior of the brim was brilliant. 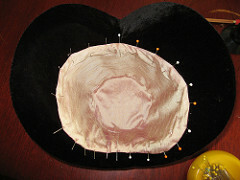 It not only kept everything together, but also acted as a guide when I began attaching the crown to it. Attaching the two pieces was definitely the hardest part. This is also when I perforated myself the most trying to shove pines through layers and layers of velvet and buckram. I probably over sewed it, but I was unsure how critical it would be, so I stitched it together like I do cartridge pleats. I put two stitches in each clipped piece before I moved to the next. I was also very particular about getting my stitches around the wires. It may not really be necessary, but I figured it couldn’t hurt. I really, REALLY felt like I wanted a curved needle through this entire process, but I desired one most in this part of the process. 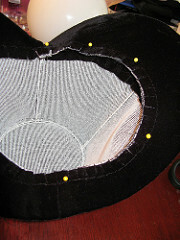 I found that using the clips as stitch guides also helped to flatten them to the inside of the crown. I have minimal stitching showing on the outside. I know this will all get covered, but I do not yet know how, or with what. If I choose to not use a full band around the hat I have that option. I went ahead and assembled and pinned in the lining, but I still have to trim this in the future, so I will leave it like this until everything else is finished. The lining is a really pretty crossweave dupioni that is lavender and gold. I just can’t wait to fill the peak with frills, and decorate this thing! I might have to make myself one. I think I already decided to make Kat a shorter one with the turned back front. 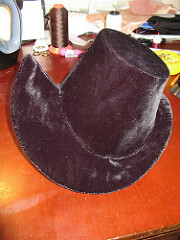 I will also be ordering Lynn McMasters new high crown hat, too! I want one of those so bad I can taste it. So, I did get the hat finished. Here are the other pics of the fluff.